It would be difficult in my perspective to be able to live a life where you were born with rights, and at any moment can be stripped of those bare rights. Having any kind of accessibility to rights signifies your existence, your right to be human, whether you are an offender or ordinary citizen. As we look back in history, we can look at the concept of the way people lived. You could essentially look into the whole concept of being exiled or banished to exemplify what it would feel like to have your basic rights taken away. In Agamben’s perspective of “bare life,” it leaves you with nothing with being forced in some notion to follow a sovereign that does not recognize these individuals as beings because of their lack of status; I would not blame these people if they decided to form a resistance against the sovereign power. For those people who have the status of “homo sacer,” there are various possibilities for acts of resisting against the sovereign that is controlling them because their overall limitation under homo sacer, deprives them from bare essentials as people. If a governmental power declared a state of exception in a crisis situation, it would be an appropriate measure to carry out considering that the government and society is at stake. Society would have to obey to this order in a crisis situation or else it will lead to resistance. A nation is supposed to look out for the public’s safety, but in reality the main purpose of declaring a state of exception is to control the public so that the government is not threatened or harmed by its people; in this reaction by the state, it leads to society being stripped out of the ordinary sphere of ‘normal legality’ to resist sovereign power. One can only imagine what it could be like in such a situation where you could not use any form of legal protection that you would normally use when you are being deprived of freedom. I would not blame these individuals to find a loop hole in a sovereign’s state of exception if they are putting them in danger. When sovereigns declare a state of exception for instance, they should be aware that people will resort to means of violence to get what is rightfully theirs if the state of exception is not justified. According to the thoughts of Walter Benjamin, there are two types of violence that are experienced in order to gain some kind of legal status from the sovereign powers by the people (Palvich). The first kind of violence that he talks about is that law is always creating violence; when you are depriving the right to have rights, you get a group of citizens who would fight back in gaining that right back; For example, the right to travel freely between two nations with a borderline being the barrier. I came across an article that provides a very interesting analysis of sovereign authority at the borders of two sovereign states, India and Bangladesh. The article further goes into interviewing some residents from both nations who cross the border frequently. Among them was a woman (Moushumi) who worked as a servant for a wealthy Bangladesh family, and would travel quietly in the night to visit her son in a neighboring village in India. Prior to the 1947 partition that took place in India, her sons’ village used to be in the same territorial land and the short trip was simple. However, the impact of the new sovereign states drew a line between her village and her sons. Should the acts of this woman be depicted as a criminal act because she violated the laws of both India and Bangladesh? Or is it due to her poor status of not being able to understand the concept of state sovereignty, or is she part of the resistance that contests the borders that divide the world into territorial defined states? We see this woman being deprived basic rights to freely enter another sovereign to see her son when the cause of this was the consequences of sovereignty (Jones, 2011). 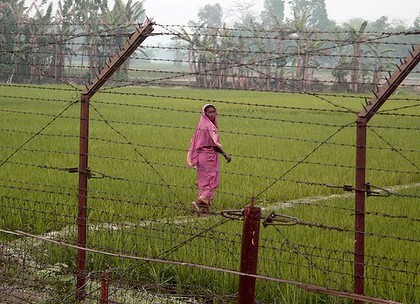 I came across an image of a woman who stares back at the borderline fence between India and Bangladesh and find it a great image that might resemble to how Moushumi sees this line barrier between the two sovereigns that used to be on one territorial land. Moreover, the sovereign gains authority not by creating and enforcing laws in a given area, but rather through the deployment of that state of exception, a time and space where people in that area have to follow laws, but the sovereign power can operate outside the typical legal system if it perceives a threat to its authority (Agamben). There are various examples across the globe where people are living under divided sovereign powers that used to be under one territorial regime. The partition in 1947 India showed a great deal of people being divided into new sovereign nations. Muslims, who lived in India at the time, had to leave their ties in India and move to their new state of Pakistan. Many of these people had grown up and established a living from generations with lots of territorial land that belonged to them and this partition led to them losing everything they had and were essentially forced to move to their belonging new sovereign power. This is another great example among many that I find strips people of their right to live where they want. We can really see how state politics harms the citizens by making them abide by what they say or else they turn into a threat to the nation. The partition in India also brought a lot of rebellion by the citizens who did not want to leave their current land. A resistance against the sovereign’s power was definitely portrayed during this time, but in the end after thousands were killed, the partition happened. It is interesting how the land you live on belongs to different sovereigns and if a state of exception occurs or evens a divide in powers, it really doesn’t matter anymore. So, I would suggest that efforts to oppose human rights abuses, indefinite detention, and other forms of exceptionalizing sovereign power should come not just from the people targeted by that power – they should come from those of us who are bystanders as well. Your analysis of the case of the woman in(between) India and Bangladesh is excellent. You propose that she may be an example of a form of resistance that “contests the borders that divide the world into territorial defined states”. This is a compelling observation.